You are asking "How come so many cheques in a month?!" Well, I'm so impatient that whenever I log into my nuffnang account and I see money that can be cashed out, I'll immediately cash out. I don't usually wait for it to add up, cos I prefer to receive money every month instead of "saving" it. Hehehe. 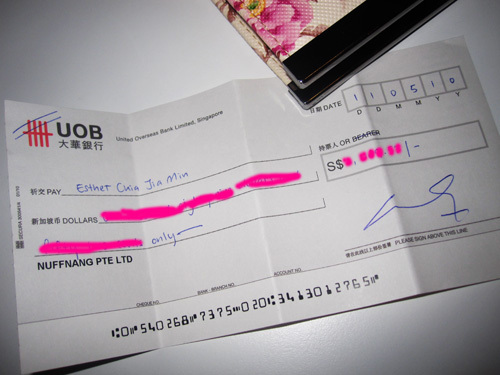 Thus, because I cash out quite a number of times a month (some for advertorials some for banner ads some for attending events), I sometimes receive afew cheques together. Lol. I urged my sis to join them just a week ago too. Besides monetary perks, they also hold attractive contests and movie premieres quite regularly. Join nuffnang if you havent!